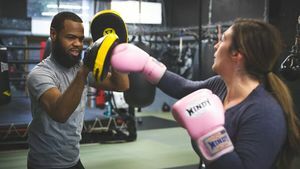 Women can box, too, at Maleek Jackson Fitness Boxing Gym. Maleek Jackson knows all about pain and struggle. He was born in the heart of South Philadelphia and became involved in a life of crime during his teenage years. At the tender age of 16, Maleek was sentenced to 8-16 years in the State Penitentiary. After spending ten years of his life in prison, Maleek decided to start all over. He discovered his love for boxing and fitness in prison, and he decided to turn his dreams into a reality. Note: The above descriptive information came from the company's About Us and Our Stories page. Philly Man Once Behind Bars Now Inspiring Others In Boxing Community, CBS-3, November 14, 2018. This page was last edited on 22 February 2019, at 08:22.